Muhammad Ali passed away last night. He was 74 years old. To say that he was one of a kind would be, at the very least, a huge understatement. Even if one strongly believes that boxing is too violent a sport to be glorified under any circumstances, I hope you would agree that the passing of this great man justifies an exemption from that belief. Above all, this diary is a celebration of Ali’s remarkable life, accomplishments, and contributions. Along with the likes of Jim Brown, Bill Russell, and Kareem Abdul Jabbar, Muhammad Ali personified the professional athlete unafraid to use his fame to confront racism and speak out on behalf of the underdog in American society. For that alone, not to mention his exploits in the boxing ring, we owe him a great deal. During this most unconventional of political seasons, when millions of people around the country are expressing their democratic will and forcefully asserting their constitutionally-guaranteed political rights, it is instructive to remember an American who did just that with dignity, conviction, and style over four decades ago by standing up to the entrenched establishment of the day and adopting controversial positions which were, to say the least, extremely unpopular at the time. He was much more than a flamboyant and charismatic boxer whose triumphs in the ring thrilled countless number of fans. Millions more around the world cheered him on for his courageous stands on behalf of freedom of speech and expression. He was called a traitor to his own country and, yet, his principled opposition to war and aggression (as a conscientious objector to the Vietnam War) made him a hero and one to emulate for an entire generation of young people. Freed perhaps from their earlier biases, not many would later question his pugilistic mastery, poetry, and personal bravery. His exploits in the boxing arena alone would have have been sufficient to enshrine his place in history. That wasn't enough for him. Exercising his free speech rights cost him dearly but his actions reflects a life that epitomizes uncompromising personal integrity and political courage. Muhammad Ali hovers over Sonny Liston, after knocking him out in the first round of their rematch fight in Lewiston, Maine in May 1965, exhorting him to "Get up and fight, sucker!" The photograph that inspired this sketch is widely considered to be one of the most famous in sports history. Read more about this iconic photograph by Neil Leifer in this Slate magazine article. John Lennon may have been right when he claimed in 1966 that the Beatles were more popular than Jesus Christ had ever been in his time. But it wouldn't last long for them. 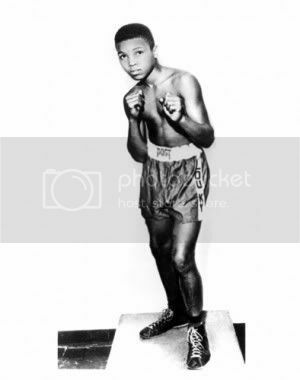 Far more than kings, queens, presidents, prime ministers, priests, scientists, and, yes, even famous rock 'n roll musicians, it was a young boxer from Louisville, Kentucky who soared to such heights in the 1960's that he, alone, would become the most recognized person in the world. Given the worldwide acclaim that Muhammad Ali finally achieved, no one diary can do justice to understanding this complicated man. This diary will briefly look at three of his fights—with Sonny Liston, George Foreman, and Joe Frazier—and his bitter, costly struggle with the United States Government, which tried to draft him to fight a war in a far-away foreign land and one he was determined not to participate in. In doing so, I hope I would have exposed you to a few photographs, videos, and poems that you may have never seen or read before. 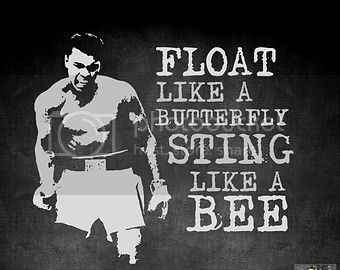 Supremely confident of his own skills and possessing a magnetic personality coupled with a quick wit, he could "float like a butterfly" and "sting like a bee." He would make outrageous claims before his highly-publicized fights and, somehow, miraculously make them come true in the ring. Everyone loves a winner. 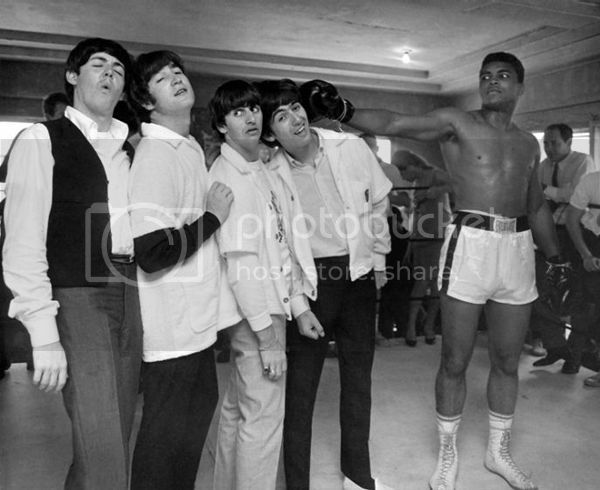 The Beatles only met Cassius Clay (as Ali was known at the time) by default after Sonny Liston refused to be photographed with them. John Lennon was skeptical of being associated with Clay for he didn't think he (Clay) could beat Liston in their upcoming fight. However, they also needed each other for media publicity for neither Clay nor the Beatles had yet achieved the worldwide fame and acclaim that they would in spectacular fashion in the years to come. Ali is pictured here clowning with the Beatles in Miami Beach, Florida prior to his first fight with Sonny Liston in February 1964. From left-right are Paul McCartney, John Lennon, Ringo Starr, and George Harrison. And then—if I hadn’t known better I would have sworn it was choreographed—he turned and the Beatles followed him out to the ring… They followed him out to the ring and they began capering around the room. They lined up. He tapped Ringo. They all went down like dominoes. It was a marvelous, antic set piece. "Robert Lipsyte describes how Cassius Clay met The Beatles" — Readers Almanac. ​Photo credit: Smithsonian.com. Read more about this encounter in "Winner by a Decision" by Lipsyte in Smithsonian magazine. See these two videos about Ali, Liston, and the Beatles—Muhammad Ali training for Liston and meeting the Beatles and Cassius Clay Conquers The Beatles. A week later, Clay would defeat Sonny Liston to become World Heavyweight Boxing Champion. Who would’ve thought that a stolen bike was the key to the beginning of the Muhammad Ali story? But it was. In 1954 in Louisville, Kentucky, 12-year-old Cassius Marcellus Clay’s bike was stolen while he and a friend were at the Columbia Auditorium. Young Cassius found a cop in a gym, Joe Martin, and boiling with youthful rage, told Martin he was going to "whup" whoever stole his bike. Martin admonished, "You better learn to box first." Within weeks, 89-pound Cassius had his first bout—his first win. "Muhammad Ali — Biographical Sketch." Muhammad Ali, born Cassius Marcellus Clay in Louisville, Kentucky, on January 17, 1942, grandson of a slave, began boxing at the age of twelve, and, by eighteen, had fought 108 amateur bouts. How is it possible that the young man who, in his twenties, would astonish the world not just with the brilliance of his boxing but the sharpness of his wit seems to have been a dull-average student in high school who graduated 376th out of a class of 391? In 1966, his score on a mental aptitude test was an Army IQ of 78, well below military qualification. In 1975, Ali confessed to a reporter that he “can’t read too good” and had not read ten pages of all the material written about him. I remember the television interview in which, asked what else he might have done with his life, Ali paused, for several seconds, clearly not knowing how to reply. All he’d ever known, he said finally, was boxing. Mental aptitude tests cannot measure genius except in certain narrow ranges, and the genius of the body, the play of lightning-swift reflexes coupled with unwavering precision and confidence, eludes comprehension. All great boxers possess this genius, which scrupulous training hones, but can never create. “Styles make fights,” as Ali’s great trainer Angelo Dundee says, and “style” was young Ali’s trademark. Joyce Carol Oates, "The Cruelest Sport." The above video traces Ali's early career as a young boxer in Louisville, Kentucky and has video clips of several of those fights. Alone among his contemporaries, he had an unorthodox fighting style, with his hands staying down most of the time. Instead, he relied heavily upon his speed and quickness to elude his opponent's punches. In 1964, a brash new pro boxer, fresh from his olympic gold medal victory, explodes on to the scene, Cassius Clay. Bold and outspoken, he cuts an entirely new image for African Americans in sport with his proud public self confidence with his unapologetic belief that he is the greatest boxer of all time. To his credit, he sets out to prove that with his highly agile and forceful style soon making him a formidable boxer who soon claims the heavyweight championship. His personal life is no less noteworthy with his allegiance to the Nation of Islam, his friendship with the controversial Malcolm X and his abandonment of his slave name in favour of Muhammad Ali stirring up controversy. Yet, at the top of his game, both Ali's personal and professional lives face the ultimate test with the military draft rules are changed, making him eligible for military induction during the Vietnam War. Despite the fact that he could easily agree to a sweetheart deal that would have meant an easy tour of duty for himself, Ali refuses to submit on principle to cooperate in an unjust war for a racist nation that treated his people so poorly. The cost of that stand is high as he finds himself unable to legally box in his own country while his case is contested in court. What follows is a battle for a man who would sacrifice so much for what he believes in and a comeback that would cement his legend as one of the great sports figures of all time. 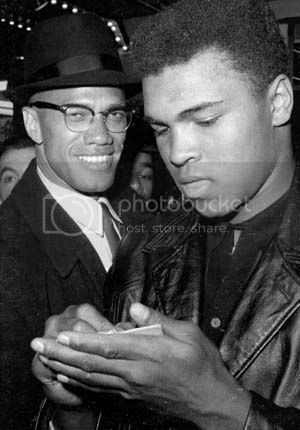 Muhammad Ali (above right) with Malcolm X in 1963. Read more about Part II of "The Legend of Cassius Clay." Also see this terrific video in which he performs a magic trick in February 1963 to the amazement of CBS's Ed Sullivan, Muhammad Ali talks with Ed Sullivan​. The above video has highlights from the first Ali-Liston fight in 1964. Both fights between the two boxers generated a great deal of controversy and unsubstantiated rumors that Liston threw the fights either because he was under the influence of the mob or afraid of the Nation of Islam. 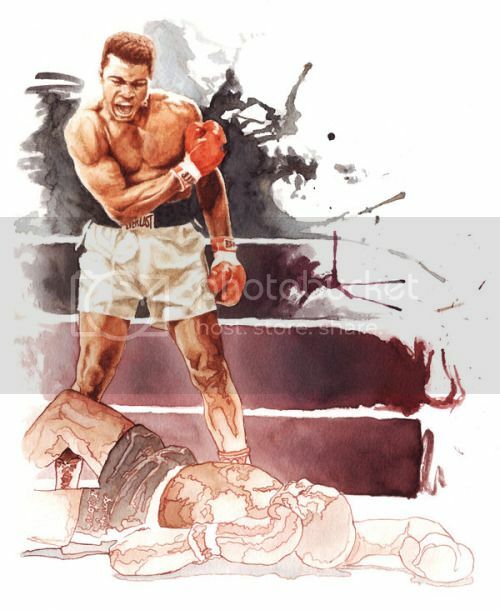 Defying all odds, Clay would defeat Liston by a technical knockout in the 6th round on February 25, 1964 to become the heavyweight champion of the world. A week later, he would change his name to Muhammad Ali. "I Ain't Got No Quarrel With the Vietcong. No Vietcong ever called me Ni***r"
Defending his title nine times over the next three years, he would be stripped of his title in April 1967 for refusing induction in the United States Armed Forces.​ What was behind Ali's refusal to be inducted and fight in Vietnam? On August 23, 1966, Muhammad Ali embarked on the biggest "fight" of his life when he applied with the Selective Service for conscientious objector status on religious grounds (as a minister with the Nation of Islam). In what became an extensive legal, political, professional, and personal battle, Ali was convicted of draft evasion, stripped of his boxing title, and became a lightning rod—and a voice—for opinions on the Vietnam War. Muhammad Ali's willingness to speak out against racism in the United States, and the affect it had on domestic and foreign policy, earned him many supporters and detractors. In 1971, nearly five years after it began, Ali's legal battle finally culminated with a unanimous decision (8-0 with Thurgood Marshall abstaining) by the United States Supreme Court overturning his draft conviction. "African-American Involvement in the Vietnam War". In the above video, Reverend Martin Luther King, Jr. forcefully defends Ali's refusal to fight in Vietnam, a war he referred to as "objectionable, abominable, and unjust." Watch this video in which Ali details how he was perceived as a black man in the United States and the reasons why he held no grudges against the Viet Cong. 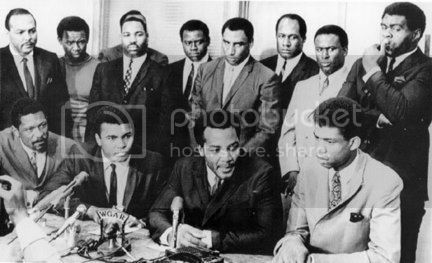 In a bygone era of professional sports—when athletes were unafraid to express opinions on political issues—Ali received a great deal of support from other prominent black athletes, notable among them Jim Brown, Bill Russell, and Lew Alcindor (Kareem Abdul Jabbar). That was a situation that had to be addressed. I was the president of the Black Economic Union, John Wooten was my executive director. I called John from London and told him to contact all of the top black athletes from around the country and have them meet Ali in Cleveland so we could discuss his situation with the draft. They all showed up and we had about a three-hour meeting with him [Ali] in the back room of my office in Cleveland. [We] realized that he was very sincere in his position and that because of his religion, he was not going to go into the Army and we backed him… It was a very wonderful thing to have these young players not worry about risking their careers, but getting the right information from the horse's mouth so that they could make judgment on this man's action. Branson Wright, "NBA 'Free-agent Summit' a Reminder of a 1967 Event in Cleveland That Wasn't about Money" — Cleveland Plain Dealer. Pictured above are Front row: Bill Russell, Ali, Jim Brown, and Kareem Abdul-Jabbar (formerly Lew Alcindor). Back row: Cleveland Mayor Carl Stokes, Walter Beach, Bobby Mitchell, Sid Williams, Curtis McClinton, Willie Davis, Jim Shorter and John Wooten. 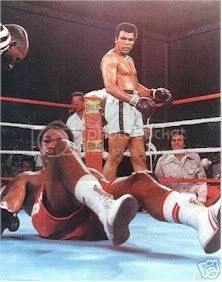 Considered past his prime, underdog Ali knocked out Foreman in the 8th round, using his now-famous "Rope-a-Dope" boxing strategy to regain his heavyweight title. If you have never seen this terrific documentary about the 1974 Ali-Foreman fight in Kinshasa, Zaire, please do so. When We Were Kings features many media and literary celebrities including Howard Cosell, James Brown, B.B. King, Don King, Norman Mailer, and George Plimpton. Author Norman Mailer also wrote a wonderful book about the fight, The Fight. I highly recommend it. The third and final fight between Muhammad Ali and arch rival Joe Frazier in 1975 may have been the most vicious of all fights in boxing history. The exploits and legacies of Ali and Frazier are forever linked in our collective memory. The maddest of existentialists, one of the great surrealists of our time, the king of all he sees, Ali had never before appeared so vulnerable and fragile, so pitiably unmajestic, so far from the universe he claims as his along. He could barely hold his fork, and he lifted the food slowly up to his bottom lip, which had been scraped pink. The skin on his face was dull and blotched, his eyes drained of that familiar childlike wonder. His right eye was a deep purple, beginning to close, a dark blind being drawn against a harsh light. He chewed his food painfully, and then he suddenly moved away from the candles as if he had become aware of the mask he was wearing, as if an inner voice were laughing at him. He shrugged, and the moment was gone. A couple of miles away in the bedroom of a villa, the man who has always demanded answers of Ali, has trailed the champion like a timber wolf, lay in semidarkness. Only his heavy breathing disturbed the quiet as an old friend walked to within two feet of him. "Who is it?" asked Joe Frazier, lifting himself to look around. "I can't see! I can't see! Turn the lights on!" Another light was turned on, but Frazier still could not see. The scene cannot be forgotten; this good and gallant man lying there, embodying the remains of a will never before seen in a ring, a will that had carried him so far -- and now surely too far. His eyes were only slits, his face looked as if it had been painted by Goya. "Man, I hit him with punches that'd bring down the walls of a city," said Frazier. "Lawdy, Lawdy, he's a great champion." Then he put his head back down on the pillow, and soon there was only the heavy breathing of a deep sleep slapping like big waves against the silence. Time may well erode that long morning drama in Manila, but for anyone who was there those faces will return again and again to evoke what it was like when two of the greatest heavyweights of any era met for a third time, and left millions limp around the world. Muhammad Ali caught the way it was: "It was like death. Closest thing to dyin' that I know of." "Lawdy, Lawdy, He's Great" - Mark Kram, Sports Illustrated. 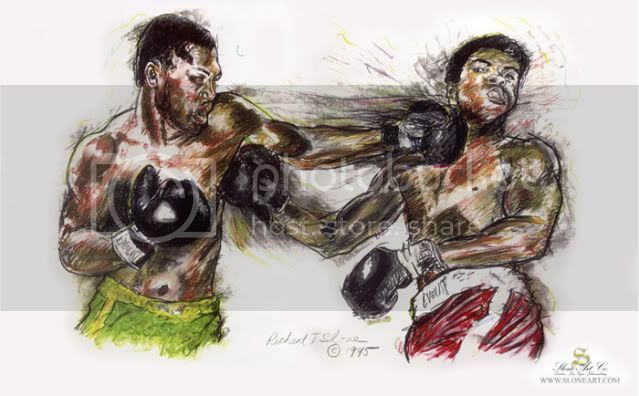 The "Thrilla in Manilla" was the third and final fight between two of the greatest boxers in history, Muhammad Ali and Joe Frazier, for the World Heavyweight Boxing Championship. It took place on October 1, 1975 at the Araneta Coliseum in Quezon City in Manilla, Philippines. Muhammad Ali defied the United States Government and political establishment at a crucial time in our country's history and criticize the American role in Vietnam when few public figures dare do so. His suspension cost him millions of dollars and earned him the enmity of many of his countrymen. Yet, Ali stood firm in his beliefs and history has proved him right. Vindication is sweet revenge in life. There has never, ever been someone like him. And, it is extremely unlikely we will ever see the likes of Muhammad Ali again in our lifetime. What is Your Favorite Memory of Muhammad Ali? It could be based on what you saw when it happened, or learned about it later on. The "Rumble in the Jungle" vs George Foreman. Forcefully Opposing the Vietnam War. His Many Playful Interviews With Broacaster Howard Cosell. Lighting the Torch at the 1996 Olympic Games in Atlanta, Georgia. Meeting the Beatles in 1964. The "Thrilla in Manilla" Fight vs Joe Frazier. His Wonderful Wit and Poetry. Hovering Over Sonny Liston and Telling Him to Stand Up and Fight. Taunting Floyd Patterson by Asking "What's My Name?" During Their Fight. Winning the Light Heavyweight Boxing Gold Medal in the 1960 Olympic Games. .... this was one of the best. Wow! “No G~d because no *evidence*! !1!” goes down for the count. Is belief in G~d — some Supreme, Ultimate Personification of the Source of Love and Consciousness — just something that can be dismissed for want of evidence, the “conspiracy theory to end all conspiracy theories,” as it were? Muhammad Ali was one of the crazy ones who thought different. going to screenshot his beautiful words from the David Frost interview, as well as several other graphics and photos that you've included. You outdid yourself with this essay! Oh, heck--just put me down for all of the above! I had one of the cable networks on as I was finalizing this diary. Chuck Wepner, who was known as "The Bayonne Brawler" and fought a fifteen-round fight against Ali in 1975, called in for a phone interview. The host wanted Wepner's impressions of Ali as an opponent. Wepner said that the night before his fight vs Ali, he told his wife to wait for him in a negligee in their hotel room as she was going to sleep with the heavyweight champion of the world. When he went to his room, there was his wife sitting on the side of the bed. So, Wepner goes, "Well..." And she replied, "Should I go to Ali's room, or is he coming here?" I couldn't stop laughing! Thanks for your generous comment, Mollie. An amazing compilation about one of my greatest heroes. I do wish Jim Brown was not on the above list of greats though. he was a great athlete and an outspoken supporter of human rights. I never disliked him when he played for Cleveland. As a kid, rooting for the New York Giants, I wanted to see Sam Huff tackle him. Sometimes that happened, sometimes not. Even though I saw Brown as an opponent I always thought he was great, the best in pro football, and held him in great respect. Because of the too many instances of domestic abuse & violence, that though many were dismissed because the victims refused to sign complaints against him, I never thought his accomplishments could overcome his faults. You can also google more about the incidents. It seems that because of his on-field exploits, his off-field actions were overlooked. I certainly don`t think he should be on the same list as Ali. I'm sorry I didn't know anything about it prior to tonight. Anytime one gets compared to Ray Rice's off-field behavior, it's bad news. I Never Saw Jim Brown Play Football in "Real Time"
... when he was active with the Cleveland Browns. However, based on what I've heard from others over the years, including ex-'Skins players here in DC like Joe Theismann, Sonny Jurgensen, Sam Huff et al, he was one heck of a football player and a ferocious competitor. Perhaps the best ever. I have seen Brown on C-Span and other networks talk about non-sports issues on more than one occasion. Just a few months ago, Brown and Bill Russell were part of a C-Span panel moderated by Dr. Harry Edwards. I must say that I was impressed by what Brown had to say about opening up opportunities for African-Americans in the inner city. Unlike Russell and Ali, Brown comes across on television as one with too-serious of a personal demeanor. Of course, very few people in professional sports had the charm, personality, and sense of humor that Ali did. This is excellent JnH. Thank you for composing/researching it. Was hoping someone would, and yours is a great job. The sports figure of the 20th century I'd say. So much to say about this one of a kind humanitarian, supreme athlete and black power radical. Devastatingly attractive, joyous, rebellious, witty and intelligent, a man radiant with deep human connection. He had a righteousness and fearlessness not often exhibited at his level of success/popularity. Was watching an interview with his last wife and the word she associated most with him was "selflessness." The David Remnick book is really, chronicling the transformational time of, before and after the Sonny Liston fight when he became the youngest heavyweight world champion and immediately converted to Islam and changed his name. Every time I take my infant son out of the bath and into his hooded baby robe, it reminds of a boxers'. Since I first put him in it I always chant the same thing: "Ali, boom-by-yay; Ali, boom-by-yay," which is what the throngs in Zaire would greet him with whenever he ran or trained in public, which was all the time when he was there for the "Rumble In the Jungle." to the memory of Ali. Don't be surprised if your son becomes a humanitarian ;)) Did your dad also say that to you, as he raised you in the air? Somehow it sounds so familiar to me. including my dad. He won a few medals, and he was amazingly strong. He loved Ali. He thought Ali was one of the greatest ever. 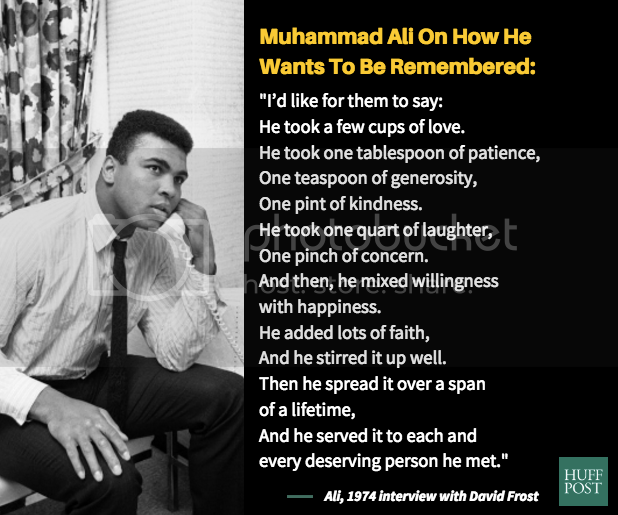 Turns out, Ali was a really great human being too. for the tribute to Mohamed Ali. It was moving. He was one of this white, elitist, privileged, young heroes. I'm not a sports fan now or then. He was dazzling and amazing. He was a force you recognize as important and universal. My first, and still maybe my favourite memory, was of the brilliant smile that covered my father's face the first time I watched him watch Ali. oh my, this is treasure of an eulogy essay for Ali, thx. I remember in Berlin, Germany, I don't remember which fight it was, it must have been between 1968 and 1971 (can only guess), a fight was projected on a big screen, in the student housing complex, outside. It was packed with curious people. First time I saw my former husband (African student back then in Berlin)) totally out of himself and cheering for Muhamed Ali. He had a similar "big mouth" and similar "political leaning " as Ali had. Well or so I thought at least back then. I wasn't too aware of the political mind set of Muhamed Ali yet. A little later I "got" it. PS Sorry for not knowing the right word. Is this a tribute, or a memorial or an eulogy essay? written, but thanks JH for this. It's the best tribute I have seen of him. And I loved his reason why he refused to go to Vietnam. Yes it costs him millions, but it gained him a lot of respect. That fight clip was fun to watch.
" Floats like a butterfly, stings like a bee" was so true as I watched him dance around Liston. thank you very much my friend. He was a great man who perhaps gave to much of himself to the people, he led a legendary life and I will never forget him, one of my heroes in more ways than one. Stream of consciousness shining because it’s authentic and good? An instructive reminder at a time when Trump has been reflecting poorly on stream of consciousness, with his critics dismissing Trump’s stream-of-consciousness, “I am the greatest” style as something unremittingly bad. Hey, Congressional Black Caucus! You with Ali, or with Hillary? President Obama, Mister President, you can say fine words about Muhammad Ali to burnish your own image all you want, but with your wars and bankers and spying and militarized police forces you aren’t fit to tie his shoes. Cassius Clay graduated HS from Louisville's Central HS, a completely segregated Black HS at that time. He must have gotten a crappy education there. Good thing he met other teachers in the gyms and elsewhere. I saw him box on the TV during dinners in Louisville. A Favorite Son. Keys to the City, probably a Kentucky Colonel, too. Ali was extremely courageous, especially when he opposed the Vietnam War. Not everyone today knows how difficult it was to be anti-war in 1967. He was convicted and sentenced to 5 years in prison even though he was a conscientious objector. The case went all the way to the Supreme Court. It was ironic that he became famous as a loudmouth yet remained a public figure after losing the power of speech, probably because he remained a symbol of courage. from people in Louisville who knew him then, a HS kid, with a gold medal.